Kerry Washington has been named the best-dressed woman of the year by People Magazine several months ago. 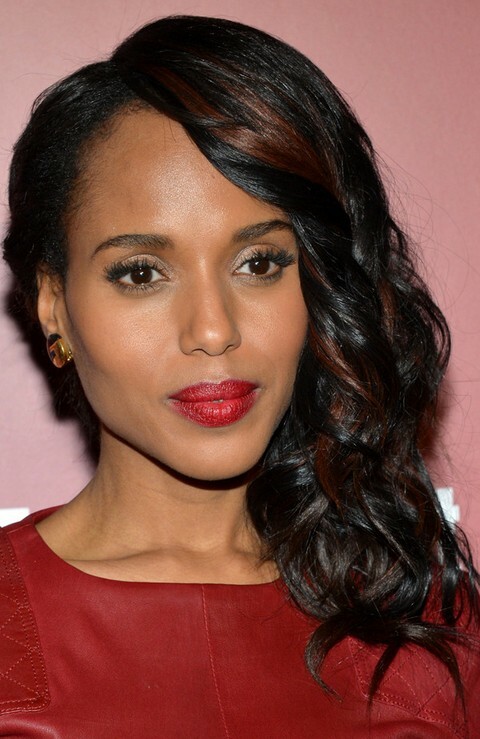 This time, we have picked out the top 16 of Kerry Washington prettiest hairstyles. Kerry looks sophisticated with this loose classic bun. The fluffy top gives the hairstyle a modern look. Anyone can experiment with it. For a younger look, you can go for this cute ponytail. Tease all your locks back and do a high ponytail. Curl the tail into subtle waves for a sweet feel. Kerry Washington wears her raven in a French twist hairstyle. She looks so gorgeous with this elegant hairstyle and the graceful pearl earrings. Kerry goes for a casual-chic look with these long curls. The side-parted bangs works well the frame the broad forehead. Long faces can try this haircut. This fluffy medium wavy hairstyle is fabulous for any face shape. The blunt bangs are great for long faces and the fluffy texture can hide the square and round corners on your face. So, experiment with it! 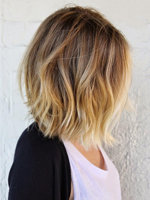 For women with medium hair, you can also wear your hair in a mid-length bob. Get some inspirations from this haircut! 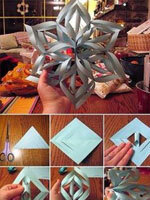 Add some volume and width to the ends. This braided hairstyle is interesting and fashionable. The sleek bangs contrast with the shaggy lengths. A medium-sized hump has been created on the crown. This hairstyle is a great choice for you when you go to parties. This loose wavy hairstyle is fabulous for younger women to get a trendy and romantic look. The upper section is naturally wavy and almost straight. The lower sections are intensive subtle waves. The center part tops off the overall look. Kerry Washington is radiant with these side-parted medium curls. The tense curls are great to add volume and texture to the hair look. Mature women can opt for this hairstyle. For a more attractive look, you can rock these side-swept long curls. Add some highlights for an ombre look, and it will be chicer. This side-swept ponytail is a good one for your nice weekend. The bangs and the ponytail should be swept to different sections. 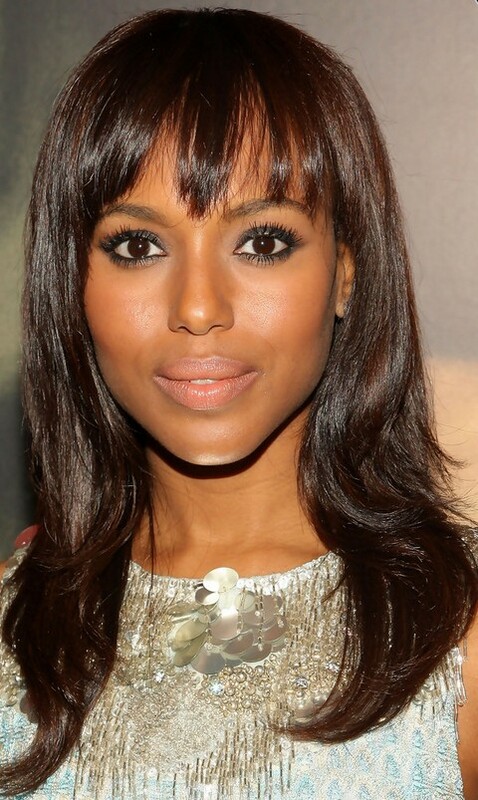 Kerry Washington looks easy-going with this straight haircut. The wispy bangs give the look a casual-chic. 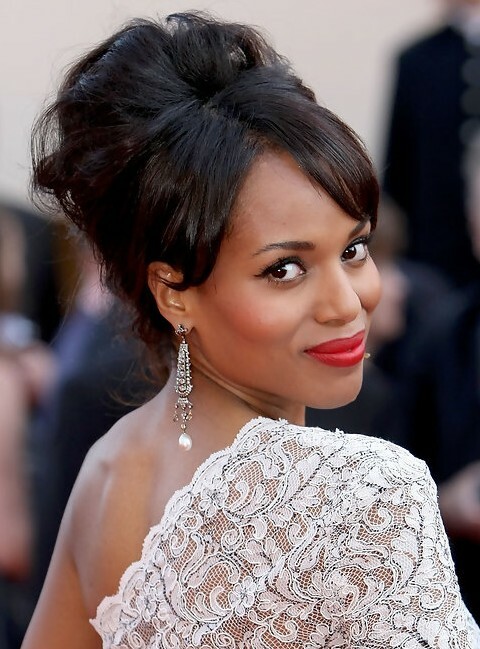 For some formal occasions, you can learn from Kerry and rock this stylish updo hairstyle. Of course, the first step is that you should style your tresses into voluminous curls. 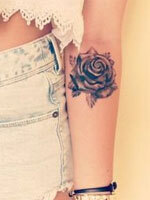 The ombre hair is fabulous for all women. 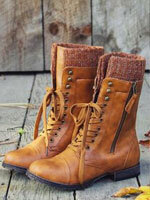 Chop off your hair make them into slight curls. The long bangs glance off the lashes, which make the overall look cuter. To get a stylish and youthful look, you can also try this straight haircut. Straight locks and straight bangs will give you an adorable look. These ultra-voluminous curls are highly fashionable, yet it’s not suitable for some formal occasions in our daily life. You can rock this hairstyle for some parties or anytime when you are free.